If you are looking to learn how to create an intranet from scratch then this post is for you. WordPress, the open source Content Management System (CMS), is the leader in the CMS space with a share of more than 60% of the market. 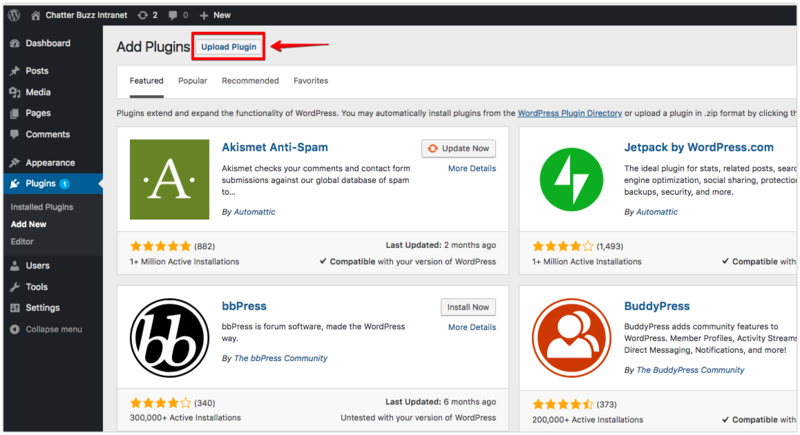 What has helped WordPress gain an unassailable lead over its competitors is how easy this platform is to use and the continuous improvement and support from the WordPress community. Over the years, WordPress has transformed from being a Content Management System to a platform which helps with business management functionalities such as team management, forums, e-commerce, project management, document management and now even company intranets. One of the key areas in which companies have used WordPress in their business is through the implementation of an intranet on WordPress. But, the ride hasn’t been as smooth as expected for businesses trying to use WordPress as a platform for an intranet. To start with, there was no single cost-effective solution that lets you set up an intranet on WordPress without pinching your pocket or worrying about security. The solutions that were available used multiple plugins to achieve the functionality and as you know the more open source plugins you use, the more security issues you can run into. 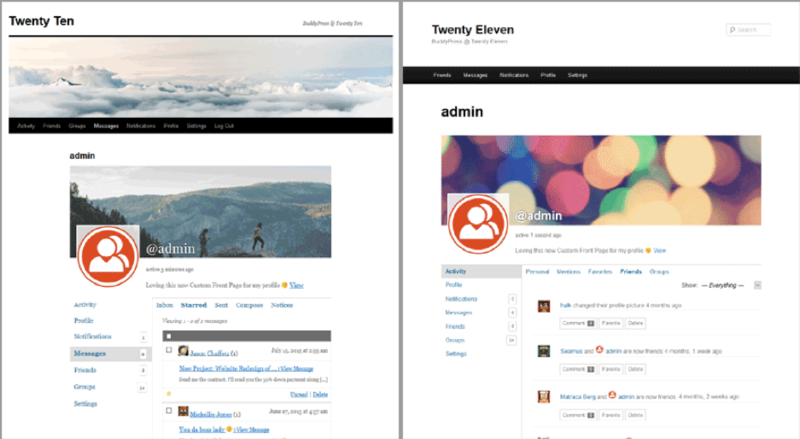 Intranet on WordPress: Using BuddyPress, Lets Start. Until now, some of the common methods to achieve intranet on WordPress involved using BuddyPress and other plugins. Basically, you set up a base for your intranet with features for user management and social networking. BuddyPress would have been a perfect solution if an intranet was only about social networking. But an Intranet is a lot more than what BuddyPress offers. Hence, you need a series of plugins to provide additional functionality on top of using BuddyPress in order to have an intranet that meets your company’s needs. Once you have the social networking feature setup, you would obviously want to secure the platform. Second, this is when you would use a plugin such as WordFence to limit the use of unauthorized IPs in order to make the network is private for your intranet. The intranet of your company now has a secure social network. Third, time to move to another important functionality called document management system (DMS). WordPress has an inbuilt basic document management system where you can easily upload, organize files and filter them based on different parameters. Whereas, the DMS works perfectly fine for a web interface where the files are available in the public domain; it is not secure for an intranet. Since DMS is an indispensable part of WordPress, the next step for you is to secure your files for a private network. Fourth, again, you need another plugin to achieve the functionality. Or if you are a PHP developer, you can write a PHP script to check if the user accessing the file is logged in or not and make some changes to the .htaccess file to make the files available to users using the intranet. 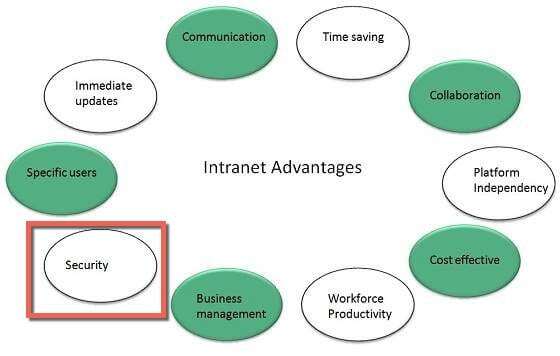 A basic intranet might work with the above 3 functionalities, but we are looking for an advanced intranet. Something that caters to the requirements of an Organization. To achieve all the above, we again need to install more plugins. Phew! That’s a lot of plugins. And when all this is done. We wait and pray that our intranet works as expected (just kidding 😊). As you would have noticed, the intranet functionality on WordPress was achieved through the help of multiple plugins working in sync to achieve functionality. However, there are big disadvantages to using this approach. There are over 55,000 ‘official’ WordPress plugins in the repository now, and many more exist outside of the repository. What an active community! Within this repository, I can tell you first hand, only a handful are actually GOOD. 1. Plugins slow your website down and increase your Memory: The more plugins you use, the slower your WordPress website will be. Every plugin has a certain requirement to run (CPU, RAM, Disk usage), and the more plugins you have, the bigger your bandwidth needs to be. 2. Plugins can cause conflicts: Some plugins do not play well together, and the more you have of those, the more conflicts are likely to arise. Even if the plugins work together in the current version, there is a possibility that one change might break your system. Different developers + different ways of coding = Disaster. 3. More prone to security issues: The more plugins you have installed, the chances are higher that you have a security risk. If one developer codes something inappropriately, you may have a security risk–especially with free plugins. As far as I know, free plugin developers do not have any binding liability to respond to your queries or even provide the consistent update or security patches that a plugin will eventually need. 4. Upgrades can be a real pain: Usually, it’s a straightforward click to update, but sometimes it’s not, and, occasionally, the plugin update may break your site, either because there is a bug in the code, or because of a conflict with another plugin. Now that’s a long list to dissuade any sane WordPress user from setting up a WordPress-based intranet using the old methods of using multiple plugins. Don’t hodgepodge your intranet and risk security vulnerability. 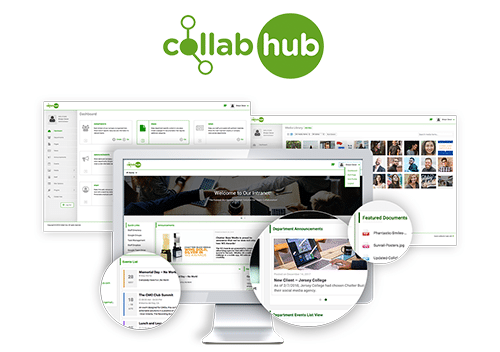 Collab Hub is an all-in-one intranet software specifically built on WordPress. It is custom made and built here in the United States (sunny Orlando, Florida). Collab Hub was built to solve all of the issues mentioned above and to also provide a cost-effective and simple to use solution for small to mid-size businesses. 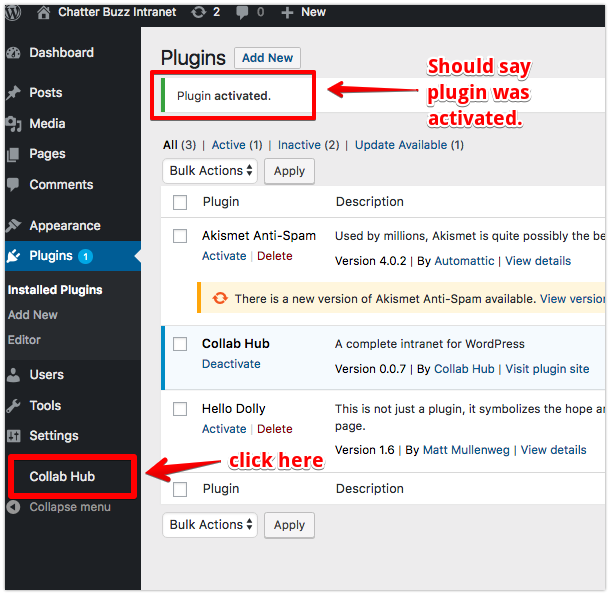 Collab Hub is a plugin that you can install on your fresh WordPress platform and with only 4 clicks (literally, here is the instruction, too), you have a full working intranet with multiple features. With Collab Hub, you pay once, install it on your server, and have unlimited users and storage. You’re in charge of server maintenance and have total control over your data privacy. If you build your own intranet using the previous method, not only will you be wasting time in setting up all the features but you will also end up paying for the premium versions because you will need to get support and upgrades. With that said, let me show you how to build an intranet using Collab Hub. How to Build a WordPress Intranet with Collab Hub, Lets Start. Collab Hub can be installed on ANY server (Linux, Windows or Whatever). You can use Godaddy, Bluehost, Site Ground, WPEngine, RackSpace, Google Cloud, Amazon, Digital Ocean, or with your own internal hosting. It doesn’t matter, as long as the server can run WordPress and has the correct rewrite permissions then you are all set. 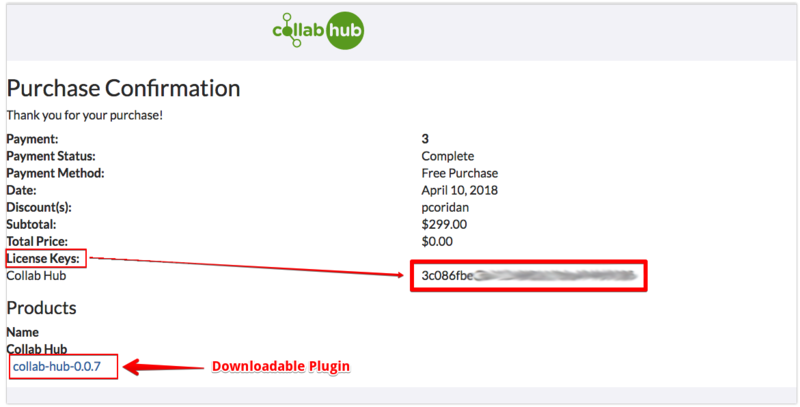 Upon purchase, you will be provided with your lifetime license key and the downloadable zip file containing the latest version of Collab Hub. Click “Activate Plugin”. It should say plugin was activated at the top. Once that plugin is activated, Click on “Collab Hub” from the menu on the left. Enter your license key in the box and click the “Activate License” button. You’re done! You can now use the menu on the left to build your intranet. It is that simple! All of the features mentioned above are now in place. No headaches, no incompatibility issues. Creating an intranet takes time and finding the right platform to serve all of your company information is very important. 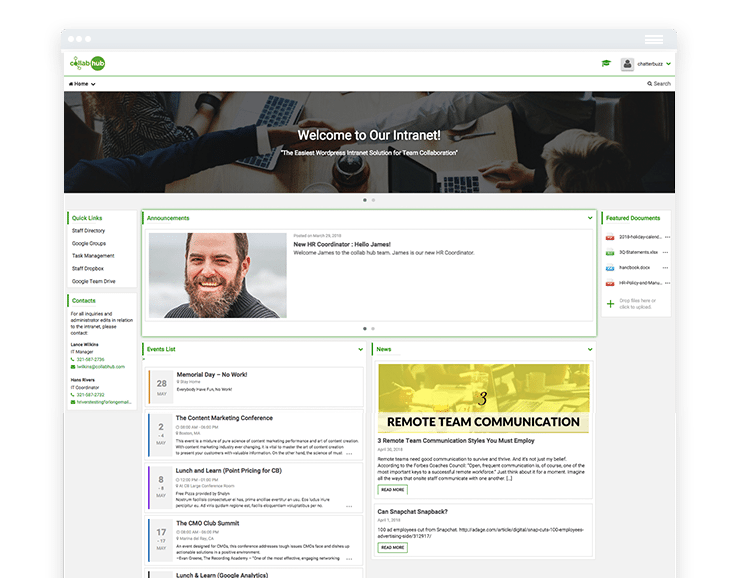 You can build an intranet the “hard way,” spending your valuable time with a multitude of WordPress plugins that may not work well together, or you could use one, surefire method and build your intranet with Collab Hub. 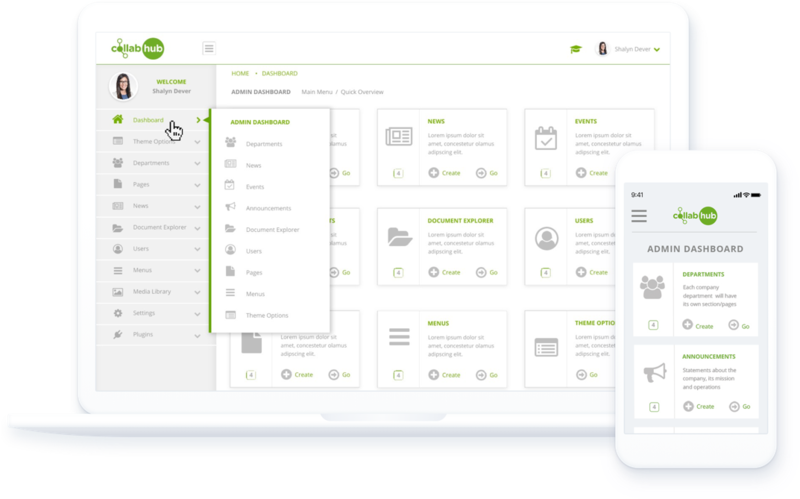 In 4 simple clicks, you can build an intranet on your own without the help of your IT or Web Design company. And don’t worry if you get stuck, your license comes with full support so you can always ask for help from the Collab Hub team. 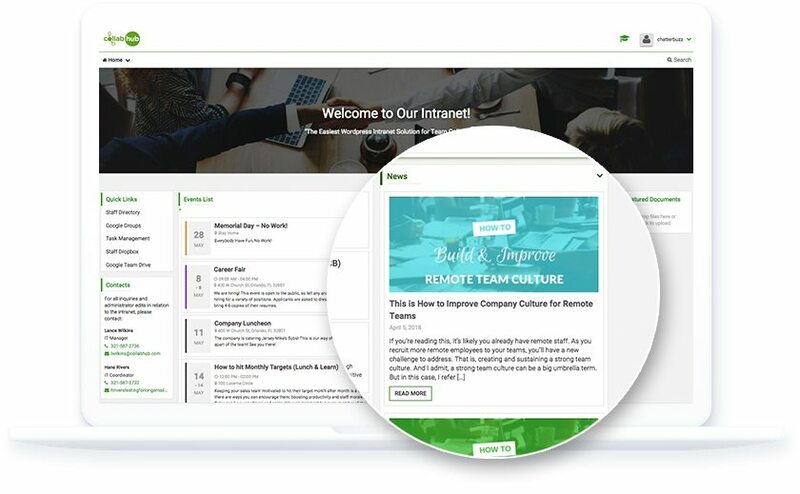 And while you’re at it, take a look at a sample intranet built on Collab Hub, if you like what you see then sign up for a 14-day free trial and see for yourself just how easy it is to create an intranet from scratch. 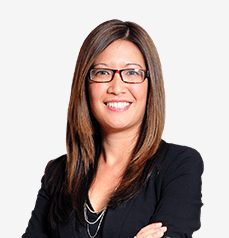 Shalyn is the Product Manager and Senior Growth Strategist at Collab Hub. An engineer recruited by Google. She loves amazing UI/UX, testing new applications and will travel anywhere to play tennis.